The Outer Church lurches into 2011 with what promises to be a truly immersive audiovisual experience. The OC is proud to present two films by American director Graham Reznick in association with Aphasia Films/Glass Eye Pix. 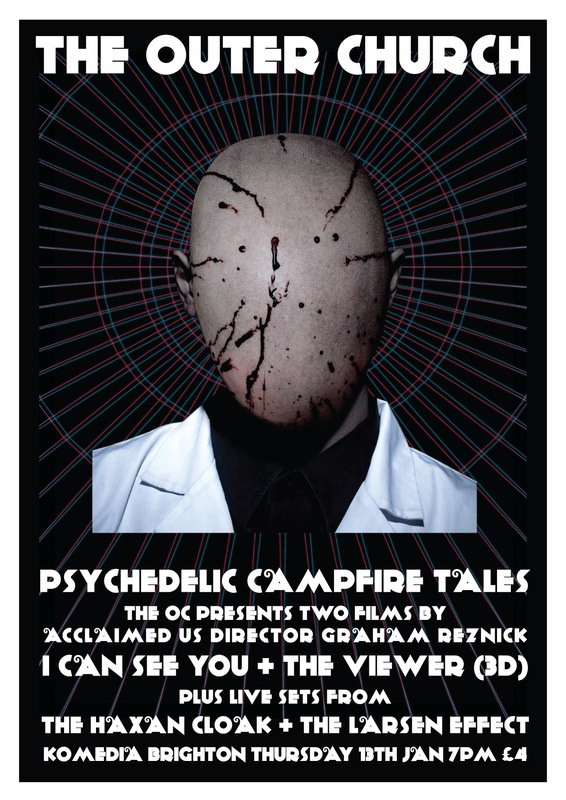 I Can See You (95 minutes) is a psychedelic campfire tale acclaimed by The New York Times as an “elusive, experimental scare flick [heralding] a splendid new filmmaker with one eye on genre mechanics, one eye on avant-garde conceits and a third eye for transcendental weirdness” while futuristic 3D short The Viewer (15 minutes) is “a telepathic interrogation experienced from the perspective of a suspected murderer.” Anaglyph glasses will be provided for the latter screening. The uncanny atmosphere will be further compounded by live sets from The Haxan Cloak and The Larsen Effect. The Haxan Cloak is multi-instrumentalist Bobby Krlic, who employs a variety of textures to erect dense scuttling fields of sonic malevolence. The Larsen Effect is the solo project of guitarist Leee Nite, veteran of the psychick wars and such esteemed outfits as Skree, Thor’s Helmet, ManTouch and Morgen Und Nite. Visuals for The Larsen Effect will be provided by acclaimed videowitch Jade Boyd. Turn up early or you WILL miss something! Thanks to everyone who attended, performed or otherwise supported The Outer Church last week. It was a blast... on a par with Tunguska, I'd say. In other news, I was recently interviewed by Frances Morgan of Sound & Music for a piece on Mordant Music's excellent MisinforMation DVD, which was screened with live mix interference from Baron Mordant at last month's OC.